28 Sep Are you getting fat? Alright, here is another one on the list of debunking some of the so called nutrition facts. Fat is not the big evil nutrient that packs on the pounds. It also plays a vital role in our health. Like everything, please use in moderation. Please be aware that fat is important but that most of us take in way too much of it and of the wrong kind. Most Americans take in 35% fat in their diet which is plenty (too much). Taking in that amount of fat blows any calorie intake up and makes weight loss almost impossible. What are “healthy fats”? Healthy fats are usually mono- and polyunsaturated fats that you can find in vegetable oils. Saturated and considerably more unhealthy fats are connected to higher cholesterol levels and are usually found in animal fats, chocolate candies, fried foods and high fat dairy products. Your fat metabolism is dependent on carbohydrates to complete the metabolic cycle. That tells you: Keep eating carbohydrates to lose weight! Fat supplementation in athletes does not benefit performance, quite the opposite it reduces performances significantly. Add fat only if the food intake should be >4000 kcal/day! 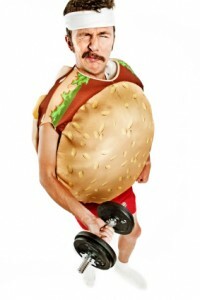 There are an additional 2000-3000 kcal of fat stored in muscle tissue. Let me know if you have any questions regarding this. If you are interested in getting lean, flat abs and toned. Check out our personal training and our boot camps. What do you think about the recent Paleo diet movement? They seem to be fairly carb-adverse. Ted, that would be correct at first glance. But what they really restrict is not necessarily a certain macro nutrient but eating grains and processed foods. They stick primarily to meat, fish, shellfish, eggs, tree nuts, vegetables, roots, fruit, berries, mushrooms, etc. The diet even finds support within the athletic community. The diet is overall pretty healthy since it emphasizes organic and unprocessed foods. Depending on the training amount there might be a problem in eating enough carbohydrates via fruits, etc in order to refill the glycogen depots (especially in endurance athletes), but I don’t have an independent study on hand that compared this diet with others and their impact on performance. I disagree on the fact that fat should be unlimited, if it is coming from healthy sources. The difference in our society, we don’t hunt or gather our food ergo we burn considerably less calories doing it and the readily available nuts and meats from the supermarket will still lead to a fat gain if the calorie intake exceeds the expenditure. Overall it is a pretty healthy diet and I do not have a problem with it.